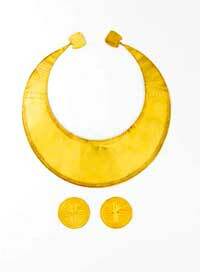 This important hoard of Early Bronze Age gold was found in a bog at Coggalbeg, Co. Roscommon, in 1945. The lunula and discs were placed in a safe in Sheehan's pharmacy in the nearby town of Strokestown in 1947. In March 2009 a break-in took place at the shop and the pharmacy safe was stolen. This lead to a massive investigation by An Garda Síochána which eventually led to the recovery of the gold in a rubbish skip in Dublin. This exhibition will run until Summer 2012.